Today, I’m happy to have Ryan Deiss on the show. Now I’ve actually been following Ryan for quite some time. He is the founder and CEO of Digital Marketer and over the last 3 years, he’s invested over 15 million on marketing tests, generated tens of millions of visitors and sent over a billion emails. He is an expert when it comes to online marketing and brand building. He runs a major conference called Traffic and Conversions every year. And he recently started a new conference called Content And Commerce which I attended in Florida. Today, he’s going to teach us the right way to market your business. Enjoy the episode! Ryan’s first set of experiences that set him off on his journey. The hierarchy of advertising that Ryan uses for his own ecommerce brands. Steve: Welcome to the My Wife Quit her Job Podcast. 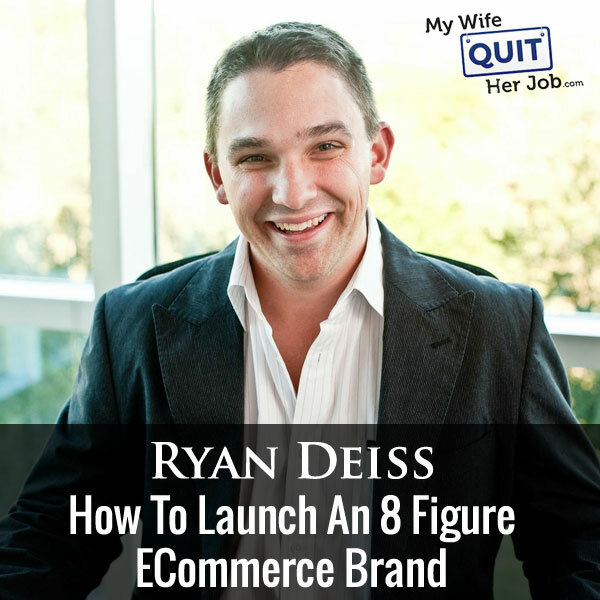 Today I’m excited to have Ryan Deiss on the show. Now I’ve actually been following Ryan for quite some time, he is the founder and CEO of Digital Marketer, and over the last three years he’s invested over 15 million on marketing tests, generate tens of millions of visitors, and sent over a billion emails of which end up in my inbox every single day. He’s an expert when it comes to online marketing and brand building, and he runs a major conference called Traffic & Conversion every year, and he recently started a new conference called Content & Commerce, which I actually attended in Florida. And let me tell you he was a hard man to get on the podcast. Here is what I had to do to get him on, and in fact for everyone listening here is a free blueprint for getting Ryan Deiss on your podcast, and I’m not exaggerating. So first off I went through his friends’ list on Facebook and reached to five of my friends that knew him, and so I had guys like Noah Kagan, Andrew Warner, Maneesh Sethi, Laura Roeder, Billy Murphy, Eric Siu, Neville Medhora email him all at the same time to intro me. Actually I split it apart, only I had like five of those guys email first, and then I saved the other guys in case he didn’t respond. And by getting bombarded with multiple emails all at the same time, it made me look much bigger than reality, and I finally conned him into coming on the show. Anyway the reason I wanted to have Ryan on the show is to teach us the right way to market your business today, and with that welcome Ryan, how’s the going man? Ryan: Thank you for having me, the funny thing is I had heard about you and the show, so you could have just emailed me. Ryan: But there was no doubt that when you get that many emails at the same time, I’ve never seen anybody else do that, it was tremendously effective, so kudos to that, and then all the difficulties of us connecting after that were just me being really busy and disorganized, so I really appreciate the work that you do. Steve: I contacted him right before his conference which was a bad idea, so like I would probably modify that strategy for everyone who is listening; don’t bother him during times of like pick stress like right before a conference. Ryan: But it was good, that was good and obviously it worked, and I’m happy to be here, so thanks for the invite. Steve: So Ryan, you’re really well known online but everyone is going to start somewhere, so before we begin with the gist of the interview, I’m just curious to know how you got started in the very beginning with Digital Marketer. Ryan: Oh gosh, like how far back do you want me to go? I mean so really this whole thing kind of started in 1999, that was when I made my very first sale online, and I was a freshman at the University of Texas and I decided to make some extra money. It started off interestingly enough; I really wanted to do something on the internet, right it is 1999 is when dot coms had blown up in some cases like literally, totally imploding I guess. But I knew I wanted to do that, so I wound up getting a job with this kind of internet startup that quickly went under, but one of the things I learned to do there was some basic web design. I was terrible at it, but because I was bad, I only knew how to design really simple web pages, and I remember one of the very first websites, it’s kind of embarrassing to remember one of the very first websites that I ever created for a client after I got let go from this company, because they went out of business. My first client was a lactation consultant, no joke, and so I’m sitting here building this website to – like build this website for her and I’ve got all these like breast pumps and all these like stuff under saying nice things, and my friends were like, dude what are you into, this is super weird for a 19 year old guy to have all these images of breast pumps or something like that on his sight. So I go on and build this website for her and she wound up not paying me, so I had this website and I had all this stuff going, so I didn’t really necessarily want to sell like breast pumps online, but one of the things that she had me produce was this little e-book on how to make your own baby food. I was like I bet I could sell that. And so I remember I built a simple web page for it and started selling that product, and dude I just made some extra money, and then I wanted to meet the girl, one I decided pretty quickly that I might want to marry this girl, I need to make a lot more money. Steve: It always starts this way you know yes. Ryan: Yeah, it’s always [inaudible 00:04:24] but yeah I know I mean really it kind of started just to make some extra money, and then it started to make a lot of extra money so I can buy her engagement ring. And long story short by the time I graduated, I was engaged, the ring was bought, on her finger and I had about a couple of a hundred different little websites, selling crazy little products. Steve: That is very nice, you’re actually smart to marry young, because as you get older the ring size and the diamond size is expected to be larger at least. Ryan: Yeah I mean at the time it seemed like it was a lot of money in the world, and I had told her we can go back – I can get you a new and we can swap that diamond for a ruby one, dude you look better, she’s like no I like this one, I like this one. Steve: Were you getting started on Digital Marketer? Ryan: So funny enough Digital Marketer started raising its head inversably this year, so Digital Marketer I tend to think we started back in 2011, and that’s because I never really thought about the teaching of marketing as being a real business. So Traffic & Conversion Summit are events, that is actually older than Digital Marketer the company. Ryan: I just started, because I was doing it, that’s the thing that’s always kind of separated me and others company from I guess other people who talk about marketing is I always just did it, I was out there selling stuff, building websites, digital products, physical products. It didn’t really matter. I got asked to speak at some conferences by people who knew that I was doing cool stuff, and I remember I would speak at these conferences and when I was done everybody was like what are you selling, like nothing. Do you have a book, do you – and people would ask me like if I could do consulting, like no I can’t, I’ve got these businesses that I’m running over here, I don’t have time. But I realized when enough people asked I should do something, so I would occasionally produce some products and I had a little email list, and I would tell my email list, “Hey I’m going to do this six week thing.” One time I had to do that to pay a tax bill, because I didn’t know, early on like the first year I made a lot of money, I didn’t really know how taxes worked, seriously like this is so unbelievably embarrassing to admit, but I had like a quarter million dollar tax bill and I didn’t have the cash. I had invested in other things and just not planned well, and so really I said hey I’m going to do this thing or I’m going to teach this class, and it’s going to be six weeks and pay me now for this thing, I’m going to do later, because I kind of got to write the check now. That was back in 2006, 2007. So I started selling products and then we decided to an event just for fun really to get – Traffic & Conversion Summit started just as a way, it’s like that high school party where you invite a couple of friends over, because your parents were out of town, and next thing you know like the whole school is there. That was sort of like at Traffic & Conversion summits, everything just sort of happened. I remember it was at Traffic & Conversion Summit number three which – you can do the math; I’m not mathing particularly well today. Ryan: But 2009, I guess 2008, 2009 when I looked out at this – 2009, I remember looking out at this crowd of 1000 people and thinking to myself, this is a business, I should call this something. That’s when we acquired the digitalmarketer.com domain name, still it took way too long to get it launched, but yeah that’s how Digital Marketer was born. Steve: That’s cool, so Ryan you talked about selling a lot of products online, a lot of these listeners out there, they are in ecommerce, and they want to sell physical products online. So I thought it would be interesting to get your perspective on how to get traffic and sales to a brand new ecommerce store. I know when I was at Content & Commerce, you talked a lot about merging content and commerce together, but you’d already had all these large content companies that you had acquired. And so I thought it would be interesting to start from ground zero, and to make this a little bit more difficult let’s talk about this ecommerce store that you’re starting from the perspective of selling something hard like jewelry or clothing, so what traffic sources would you experiment with at first, and what would be your main focus with limited resources? Ryan: You see the first question that I always want to answer before we even look at traffic or anything like that is who? I’m a big believer, every business that I’ve ever started whether we were selling digital products or physical products, and we incidentally make a lot more money selling physical products than we do digital products, so I love physical products, I love selling stuff. I’m best known for Digital Marketer and for the digital stuff, but there is a big building for the people that focus on selling hard goods. But in every business, and this goes all the way back to literally when I sold my very first e-book on how to make your own baby food, every business I had ever started was market centric, I think this is so critical especially for ecommerce people. They decide that they want to sell something, I’ve got this product or I found this cool thing that I can get a good price on, and so they want to build a store around it. And more times than not I see this mistake happen especially in ecommerce, people define the business by the products they sell, when they should be defining the business by the people they serve. You don’t define your business by the products you sell, you define it by the people that you serve, and that’s so unbelievably critical. Steve: So what are some exercises that you can do to figure out the who? Ryan: Well, I mean I think a lot of it is kind of intuitive, right? I mean it’s an A, you just – sometimes it’s really simple, you know that a certain someone is going to want to buy this, so I mean we sell a lot of knives and stuff like that, so we know people who are in the camping and outdoors are going to want to buy that particular item. Does that mean that a soccer mum would never buy a knife? No, of course not, they’ll buy knives too, but I think in the beginning what you have to force yourself to do is to niche arbitrarily, and that’s the hardest thing in the world, because everybody says, oh everybody is going to love this, but I would just kind of reference and point to Facebook. When Facebook first launched, granted it was – works for everyone, but Mark Zuckerberg said we got constraints here in terms of server loads and stuff like that, so this is only open to people who are at Harvard, that’s it. People who are at Harvard, this is who we’re going to serve, then it expands to other I believe universities, then all universities, then all universities and high schools and then finally kind of every man, woman and child on planet earth. So in the beginning I would say look at your product and say who is the most obvious customer for this product, and get it as narrow as you can stand it, because you can always go broader, you can always go broader. Wal-Mart started in just a really small town store like these tiny little stores where they stood out by offer the lowest prices and stayed open longer than anyone else and then once they established that foothold, then they were able to grow and expand. So I think that’s for steps is just niche down arbitrarily, so let’s give an example where you’re looking at clothing, right? Steve: Okay actually I have a perfect example like I started with handkerchiefs, and we started with just that one product line, and we became the largest supplier of handkerchiefs, and then we gradually expanded to other linens. Ryan: Yeah, but I would ask myself like who is most likely to buy a handkerchief, right? Do you know in the beginning the people who were actually buying it? Steve: We targeted brides, and that’s it actually. Ryan: Or selected gift to the groom, or was it some handkerchief that they used. Steve: That they used actually. Ryan: Great, bridal party handkerchief, so you’re going to start there. So what you’re saying initially, and this is what’s so beautiful about this whole thing is you can say right now today I’m going to start selling this item to this group. Now at some point you will have a choice that you can make, and the choice can be both, but then you have a choice that you can make, okay you’re going to start off selling handkerchiefs to brides. Now you could say, okay I want to build a business around a certain thing brides and wedding parties, you can go that direction. Or you could say no, no who else buys handkerchiefs, I want to expand laterally, I want to expand and take this product into other markets, but you always have to pick somewhere, because just like you said, and just like you alluded to in your initial question, where do you start, where do you begin? And I think this is where people blow it. They are like, okay so I have the internet. Let me narrow that down to Facebook, God it’s still too many people, and if you go on to Google and you say I want to target everybody who searched into handkerchiefs, if you’re just getting started, you’re going to get obliterated, you won’t break through, there’s too many other people that have gone before you. Never forget that at the end of the day, here is somebody who is able, and willing to spend the most to acquire a customer, they are going to win eventually. It’s not about who has the best product, it isn’t really about who has the best marketing, it’s who is able willing to spend the most to acquire a customer. If you’re just getting started, you’re on a shoe string budget, you don’t want to go head to head on Google AdWords against – I don’t know who the biggest handkerchief supplier is now on Google, but you don’t want to go head to head against them. So that’s where you have to come and pick a niche within a niche so you can establish that foothold and begin to generate some revenue and learn a little bit more about the customer. So it’s always, always, always answer the question of who, who am I going to serve today? With understanding that it may change tomorrow, you may expand that, it’s all fine, but today who are you going to serve. Then I tell people always start on Facebook, that’s where we begin every single business, I don’t care if it’s B to B, B to C, no matter what you’re selling, you’re always selling it to humans, it’s always H to H, always human to human. If you want to target humans, humans are on Facebook. Once you’ve answered the who question, now targeting on Facebook becomes much, much, much easier. And so that’s always where we begin from a traffic stand point. Steve: Okay, let’s go into a little bit more depth about Facebook, and maybe we’ll use your knife story as an example from the very beginning. So you know who you are marketing to, you picked a very small niche, what does your first Facebook ad campaign look like? Ryan: So what it always starts with is – let me say this, it almost always never starts with a store, it always begins with an item, a single product, and that’s for multiple reasons. One, a store is more complicated to build, a store is more expensive to stock, but we also found, again if we’re targeting – if we think about the who, there is one particular thing they want more than anything else, somethings that’s going to be super awesome. And what I want to do, my goal is to acquire a customer, it’s not to make a sale, it’s to acquire a customer, that’s always that initial goal, not how do we sell this thing. Steve: That means your customer is someone who actually pays money, or someone who signs up for an email list? Ryan: Someone who pays money. Steve: Okay, got it, go on. Ryan: I want someone to actually buy something, so that first item is usually going to be something fairly inexpensive, or it’s going to be something incredibly expensive where I’ve gone in the same margin I’m looking to make very few sales but spend a lot. I don’t want to be someone in the middle; I don’t want to be selling commodity type items. I even want to be selling something ultimately desirable, like something that’s really cool but really cheap, an impulse buy item, or I want to have the ultra premium luxury item. I want to go way up above the market, and I want to go way below the market, there is room in both ends, there is almost no room in the middle. So when we first went into the knife space, we came out with this credit card knife, which now it’s been like a knock off a billion times, they have advertisements in every Canadian airport saying don’t bring this knife on the plane, because we sold so many of these knives. We advertised it as, hey this is the coolest knife in the world if you’re into every day carry. It is not going to necessarily be appealing to the soccer mum, but it is going to be appealing to the market that we want, people who like to walk around with a knife at all times for personal protection or just it’s nice to have a sharp thing. We’re speaking to our audience that we want, we’re not just not targeting them in Facebook but we’re speaking to them in the message we bring, does that make sense? We’re speaking to them in the messaging, because I just don’t want to sell a product, I want to acquire a customer. the customer I want, the one that loves knives so I’m going to use that messaging on the landing page, and in the ads to speak to the customer, and then have a really low dollar item in there to acquire them. Now what we were able to say once we knew that worked, we were able to say, on the next page down in the sequence; hey you just got the coolest little knife in the world. Now we would like you to have the coolest big knife in the world, check this out, this top glittering knife, here is everything it does, blah, blah, blah, but we didn’t develop that large, premium item, until we knew we could acquire a customer base. That’s always – just again I don’t care what business you’re in, the most important, the most critical question every business must answer is how you’re going to go about acquiring customers and ideally at a profit. Steve: With that credit card knife, did you guys give that away, or was it just ridiculously cheap like free plus shipping or was it just like a really low dollar value item? Ryan: We had a bunch of different variations of the offer, but if they just paid $2.95 in shipping and handling on the low end which I would still consider that person to be a customer, because they have gotten out the wallet, they have done something to acquire it even though it’s free. We tried to bunch it at different variations based on where we were selling that item. Steve: And just curious, who exactly were you targeting with that first promotion? Ryan: We were typically targeting people who were interested in outdoors camping, hunting, fishing, survival preparedness, those kinds of things. Steve: And I’m just curious, of those people who took advantage of that offer, how many of them took advantage of the more expensive offer when it was presented to them? Ryan: It depended on the price point and where it was offered. So in some cases if somebody bought it, and they didn’t receive that as an immediate upsell, it would be less, maybe you’re talking like 8 to 10% of the people we get to send at some point in the future. But yeah I mean you can make that immediate offer, that immediate up sell, just like what Amazon does, people who bought this also buy this. It’s always going to be more effective, and 15 to 30% wasn’t uncommon depending on a traffic source. Steve: Okay and then let’s talk about what you do with the people that don’t buy, and how do you nurture them to eventually make a purchase? Ryan: Yeah, when you find out where they live, you steal their cat, and you tell them that you’ve got to come back and buy. Steve: You stalk them on Facebook? Ryan: Yeah, it’s kind of like how you got me here. I mean it’s exactly what you said, it’s nurturing, it’s continuing to add value in advance, sending them content, continuing to talk to them about the stuff that you know they are interested, and that’s why I said the who is so important, because if all you do is sell them knives, and you don’t really know who is buying it, then what are you going to talk to them about. If you don’t know the who, you don’t know what you’re going to talk about, and content marketing is why so many people have such a difficult time with content marketing and starting a blog is because they don’t know who their who is, and so they don’t know who they’re talking to, and so they have a hard time talking. So yeah we have a newsletter about personal preparedness and we did product reviews and content how to use one of the things and every now and then we run a sale or we introduce a new product or offering and maybe somebody who wasn’t interested in the big knife, maybe they were interested in a cross bow or something else we’re selling, or maybe there is this really cool watch that we have. When you have an audience, when you’ve already aggregated the attention, then building out a product line just becomes fun and easy. It’s much easier than doing what a lot of people do which is just, okay I want to have a store, and I want to sell knives, because I like knives, so let me go and find out about knives. Okay I feel like if I’m going to have a decent store I need to have about 15, 20 items, let me go and figure out what these things are, write the product descriptions, put it up. Okay now you got a store and you drive the traffic to it, nobody buys anything. Nobody buys anything, because the knives you’re selling aren’t any better at least as far as the picture and description are concerned from this same knife they could buy a brand they’ve heard about, or from a retailer they know already. If you’re going to compete coming out of nowhere, you got to have some differentiation, and then eventually I believe you got to build a community. Steve: Let’s talk about that for a little bit, so when you’re first starting out, were you selling other people’s knives or did you have your own line from the start? Ryan: No, starting out we were always – we always begin with one item, one item and then along the way we’ll steal other people’s stocks, and if it works, if people buy it, then we’ll go to those people and say, hey we want to private label it, so we want to label it, or if they won’t play then we will develop our own. If it’s something that we feel like we can do and improve on the product. If somebody truly has just a far superior product and the patents on it is protected, then we’ll continue to sell their thing. We’re not going to come out with a worse product than something that’s already available in the market just so we can call it our own, because then it’s not serving your audience. But yeah the way that it grows is we’ll start off, we might buy a batch of somebody else’s products and just wholesale it and have real too thin margins but find out, wow people really liked this. So while we didn’t make any money, we also didn’t risk and locked up a bunch of cash going over there, doing direct importing or custom manufacture bringing some of those kind of things. I always want to know that people are going to buy it before I write a big check. Steve: Okay, yeah I was going to ask you like how much price compared to this in the factory in here if you’re selling other people’s products, but it sounds like your main goal here is not necessarily to make a profit in the beginning but to gain like a list of customers that you can market to later, is that accurate? Ryan: Yeah, I like getting paid to do market research. Steve: Okay and in terms of like just getting their emails, I know you do this for Digital Marketer where you give away a free piece of content, but for those people who don’t use the triple R, they don’t pay you any money, what do you do with those people? Ryan: We’ll continue to follow up and as we come up with additional offer, we’ll take them off the first offer. So maybe they weren’t interested in the little credit card knife, but they did go ahead and still subscribed for our newsletter, because most people do totally free offers as well, it’s totally free accounts and offers, special reports, those kinds of things, and we’ll just offer them something else. Just because they didn’t like this doesn’t mean that they’re not our market fit, and that’s the difference between – you own it let’s say message to market fit and product to market fit. You could be speaking to an audience with the right message, but then when you put the product in front of them that corresponds to that message, maybe they say, I don’t like that. It doesn’t mean that they didn’t agree with your over arching message, the over arching message could be if you’re a responsible adult, it makes sense to have a knife on you, right? Whether for personal protection or just because you need to cut off one of those like obnoxious electronics cases when you buy something you know that everything is in. It’s handy to have a knife with you, so if that’s the message then you say; hey do you have a knife, so that’s where you might want to check out the credit card knife. They maybe look and they go, that knife seems too small and it’s too thin, I don’t need that, it’ll probably get lost, so maybe they’d say no, but maybe I come back later and I say it’s handy to have these things on, so check out this watch. This watch has all these other things built into it, it’s got a little cutting blade here that you can pull out, it’s got this thing over here and then they go, oh cool I like that. So you can nail the message but miss some of them, have the message to market match but miss on product market fit with some of the market. That’s why you just – if they didn’t buy this thing, lets’ come up with this, that’s merchandising, let’s come up with new things that we can put in front of them that they will buy. Steve: So just to summarize everything that you just said, it sounds like you have a pool of people that you just try and get to spend any money on them at all, and you are constantly trying different offers to get them to spend even a little bit of amount of money. And then the people that do spend some amount of money, you send them an offer to that something larger, and for the people who take advantage of the larger offer, you can continually sell to those guys, because they are loyal customers, is that kind of accurate what you said? Ryan: Yeah, the easiest thing in the world to sell and the thing that will always have the highest conversion rate is more or better than what somebody just bought. So a lot of times we’ll say, hey you got one of these, how would you like to get three more at a discount. That could be a logical up sell to increase your immediate customer value, and the product line expands as the intricacy of the audience expands. And then eventually one audience can birth another audience, it’s how we’re able to spin off from survivallife.com, which is a branch of survival and preparedness people into homestudy.com where we have pioneers etcetera, because we knew that there was an audience. We looked at it and we said, wow, oddly enough we do have a lot of soccer mums on this survival and preparedness kind of thing. What they were liking was the home improvement stuff, the vertical gardening stuff that we had, things on color preparing, family emergency patterns and those kinds of things, the responsible stuff. So we spun off and created a separate property for them, which now allows us to talk to that audience in addition to the one we’re talking to, we just create another property for them. We’re able to advertise now a whole product line developed around that. Steve: You know one thing that we did not talk about so far is Amazon. What is your take on people who just start on Amazon and stay on Amazon, is that a strategy that you would recommend? How would you proceed with Amazon? Ryan: I think starting on Amazon is really, really smart especially if – I mean because it’s a built in audience, and there are ways to hack at Amazon, it is not as easy as it once was, but there are still ways if you’re willing to drive, to prime the public just a little bit through some advertising to drive your sales up on Amazon. And if you have a good product, and you can push it to the top, it’ll tend to stay at the top, so I think that’s great. So I think starting on Amazon is fine, the only thing you have to be careful of, and I learned this the hard way is if you don’t have all of your logistics in place, and if there are some quality control issues, you’ll get slaughtered on Amazon. So we sold some chemical products that were actually in the equine markets sold to horse owners, and it was a great product but in the shift to Amazon some of the shipments didn’t make it to Amazon to do with the fulfillment, so people bought stuff and things were delayed. People got really, really upset and then when our factory was trying to speed things up, they made some mistakes on the formulations and things didn’t work quite right, it was just a big mess. It was out fault, we messed up, but the scary thing about Amazon is you can make an honest mistake and you can fix it with the customer, but those reviews will linger there. And so the danger to launching on Amazon is if you don’t have your ducks in a row, you can get nailed on the reviews, whereas if it was on your own website you make a mistake, you apologize, maybe you get a refund, you send them cookies; you do whatever you got to do to make it right. Mistakes are going to happen in business, but at least they are not leaving a review on your website that’s going to hurt you moving forward. But absolutely, launching on Amazon is like if I wanted to come out of the line in a barbecue sauce or something like that, and I just asked Wal-Mart, hey can I set a little table out in front of the Wal-Mart and start my barbecue sauce, and they are like yeah sure go ahead and do it. You would be crazy not to take them up on that, because if they see you’re selling a ton of barbecue sauce, maybe they put you on their shelf. So I think it’s smart, but to stay on Amazon, and to only be on Amazon is dangerous, because really what you are then is you’re a wholesaler, Amazon is a retailer. You don’t own the customer relationship, that is Amazon’s customer. So we like to be on Amazon, and we’ll drive traffic to Amazon and do all that, but we still want to be building our own communities, and maintaining our own customer relationships. Steve: The reason why I asked you that question is because when I first asked you about starting out, you mentioned go on Facebook and promote one product first. Would that order still be the same, would you still proceed on Facebook and develop your own audience first and then go to Amazon, or the other way around? Ryan: That’s what I would do and that’s what we have done. We’ve started on Facebook, buying advertising to sell a certain item to build an audience, and then once we knew it had a pulse, then we would expand and put those products on Amazon as well, because for us what it came down to was just inventory management. We didn’t put a lot of our products on Amazon, because they sell out really quickly. And so I can sell them through our own channels and make a much better margin, or I could put a bunch of stock in Amazon, and not have too much to sell through our own channels, and when you’re doing really big volume, but you’re a self funded company as we are, I kind of imagine the cash flow is a bit interesting. So my recommendation and what we do is start off selling through your own channel some individual items through your own store whether it’s a Shopify store or just a simple web page, and then quickly move to Amazon once it’s clear that you got a good product that people like, because if you are effective at advertising it, people are going to go to Amazon to look for the product. I have a friend of mine who is former VP of media and acquisitions for Beachbody, big infomercial companies selling fitness products, and we’ve told him for a long time, Ernie you need to get your stuff on Amazon and he didn’t want to do it and the higher ups at Beachbody didn’t want to do it either is because they were afraid that it was going to cannibalize their sales. What they found was that the people who bought through the infomercial, the people who bought through the website did that, but then there was this tall giant audience out there, this massive customer base that had no desire to buy off an infomercial and had no desire to buy from a website, but they would buy on Amazon. So when they put it up on Amazon, it was just a whole lot of free money, like hundreds of thousands of dollars in free money every single month. Steve: So when you have your audience in place, do you market to both at Amazon and your store then? Ryan: Yeah, we’ll kind of mix it up. If we start to see our Amazon rankings dip a little bit, just because of lack of sales, maybe sales a little bit slow over there or maybe you got a new competitor coming into the marketplace, bringing a lot of energy, then we will divert a portion of our ad budget instead of sending it into our own page, sending it to Amazon. Steve: Okay, and in terms of your favorite ways to get in front of customers, did you say it’s email and Facebook retargeting, or do you use any other methods? Ryan: I mean Google, when you get going I think you’re crazy not to do especially as your branded search goes up, people start searching for your products by brand, you’re smart to buy Google ads and to get out here. And so we’ll always start with Facebook, once we build our retargeting audience, obviously spend more on Facebook retargeting as we build our email list, and we’re sending regular email operations, the next step that we go is to Google. And then you start playing with – depending on your market, you might go up to affiliate networks. It makes sense to put your stuff in Commission Junction or ShareaSale or some of those other ones, or have your own affiliate program. It can also make sense to try different content, just get on every platform, so Outbrain, Taboulleh, those types if you have content going. It doesn’t work for everything, it can be expensive, but we found in broader markets like beauty and things like that it can work well. Steve: What about Facebook Messenger marketing, are you using that a lot yet? Ryan: Just getting started testing that, so I can’t say that we’re using it a lot. I’m very, very excited about Facebook Messenger, and the ability to create lists essentially in it to do follow up, so we’re doing some testing there. I don’t have enough data to report back, but I can’t see how it’s going to be a bad thing. We’re testing ads in Facebook Messenger, and all those stuff to build our Messenger audience, and I’ve also – it’s funny but apps, if you can build a store, having an app would be – you can do push notifications. I think the future is coming up with ways to communicate with your audience outside of email. I’m not saying email is dead or dying, but just give me multiple ways to communicate. Retargeting is a way to communicate with your audience and to talk to them. Messenger, different messenger apps is a way to do that, having your own apps, you can do push notifications and things like that, it’s big. Steve: What step in the hierarchy would you even consider an app for yourself? Ryan: I think it’s pretty far down the road, I think you have to have a pretty significant customer base to following — building a big brand, and you probably won’t be able to build an app around a product. I think an app is going to be built around the audience. So I think Survival Life could have an app for survival and preparedness enthusiasts. Hoffman Richter which is our knife brand, I don’t see why anybody would ever download a hoffman richtor app, but if people go on there, consuming your content, maybe through your blog or a podcast, I know we’re launching this for Digital Marketer, because we have a lot of content on our blog, and we email out some of the content, but I know that people would love to consume it in app form, they told us that, same with our podcast. So if we give people the opportunity to listen to podcasts in the app and receive content there, that’s great, because we also have an opportunity to communicate with them through that app. Steve: That’s awesome Ryan, hey I want to be respectful of your time, I know you got a meeting in like a couple of minutes, so let us close it right here. If anyone wants to get a hold of you or learn more about you, where can they find you, and tell us about your conferences in your bed that’s coming up? Ryan: Yeah I mean definitely digitalmarketer.com, check that out at digitalmarketer.com/blog. You can get some of our free content and yes we will at that point retarget you, so you will get some more retargeting ads and action, and we have a 15,000 member community called Digital Marketer Lab that there is an opportunity to request. It’s an invite only community, but there is an option to request and invite there on the home page, so definitely people should check that out. And then if you’re in the business of marketing stuff I think you’re crazy not to be at Traffic & Conversion Summit, trafficandconversionsummit.com. Check that out, it’s in San Diego, California in March, I think it’s March 9th through the 11th, but trafficandconversionsummit.com, check that out. We’re expecting 4500 people this year, so I keep saying it’s the largest conversion conference in North America and nobody has called me on this, so I’m going to keep saying until somebody tells me it’s not true. And then you mentioned Content & Commerce Summit, the one we just did a couple – back in – when was that, September, and it seems like forever a go, yeah and I think longer but yeah, so we just did our first Content & Commerce Summit in September, and we’re planning to do another one in September 2017. Really the whole idea behind that conference is to bring together digital media companies, people who are building audiences, we have ecommerce companies, because I think that these two groups need to know one another, they need to hang out a lot. I think they are one another’s or should be one another’s best friends, so yeah. Steve: And as a foreword they put a little plug too, like if you guys want to know how Ryan Deiss operates, you can just sign up on any one of his lists on email, and you’ll notice that he’s trying to get you to buy something really small like $7 or whatever and that will take you on to another funnel. So it’s just really interesting if you go ahead and just buy some of these things and just watch how his funnels are working. Ryan: Just know we do screw up a lot of times, so if you see something that looks weird, there is a good chance we’re testing something that’s failing miserably. So I tell people, do as we say not always as we do, because sometimes we do stuff that just doesn’t work. Steve: All right man, so thanks a lot for coming on the show, I really enjoyed it man. Thanks a lot.